Regal Wealth Scam Review - Please Stay Away! Regal Wealth may seem like an interesting online opportunity at first, but we’ve received complaints from readers about losing money with the software. To ascertain if Regal Wealth is a scam, we’ve conducted a thorough investigation. Read our Regal Wealth review for the evidence and find out the truth! Will Regal Wealth make you any money at all? Just like many other binary trading software scams, Regal Wealth runs on a lot of hype and promises to lure its victims into the scam. You most likely got to their homepage through a shady email, a random pop-up, or an advertisement banner that you see somewhere on the internet. 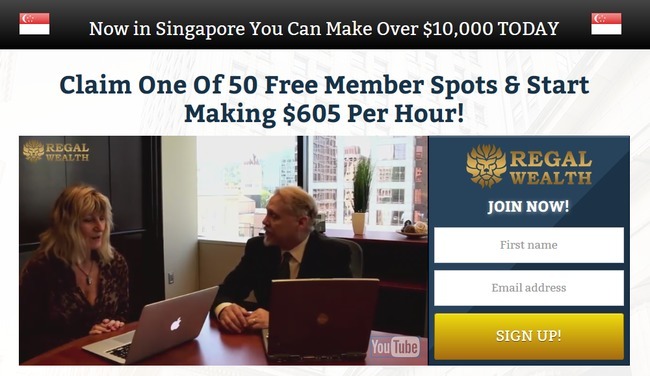 You have to exercise caution and think if it’s possible for a random opportunity on the internet to generate you $605 per hour, while promising that you don’t have to put in any work at all. If it sounds too good to be true, it probably isn’t true. This is essentially what Regal Wealth is promising you with their fully automated binary trading software. If you don’t have any experience trading binary options, let us provide you some background on how it works, and how automated binary trading software like Regal Wealth operates. Binary options has been gaining popularity in the recent years due to its simplicity compared to other trading instruments. Instead of reading complicated charts and analyzing market movements, binary options rely mostly on ‘trading hunch’, where traders guess if an asset’s price will rise or fall after a short period of time, usually between 30 seconds to minutes. Let’s say I predict that the price of oil market will be higher 1 minute later, and I bet $50 on a 1-minute binary options contract. If I’m right, I win a certain percentage of what I bet, usually between 60% to 80%. But if I’m wrong, I lose the entire $50 (100%) of my bet. Therefore, trading binary options is not that different from gambling. There’s no way to predict market movement in such a short period of time. Even if you manage a 50% win rate, you’ll still lose money due to the uneven winning vs losing payout. It’s so risky that even Forbes warned us against trading binary options. Regal Wealth steps in as a software that trades on your behalf, and Michael King claims that his software can help you win most of the trades with its trading algorithm. But is he telling the truth? Apparently not. Let’s debunk some of the fake promises made by Regal Wealth scam in their sales material. 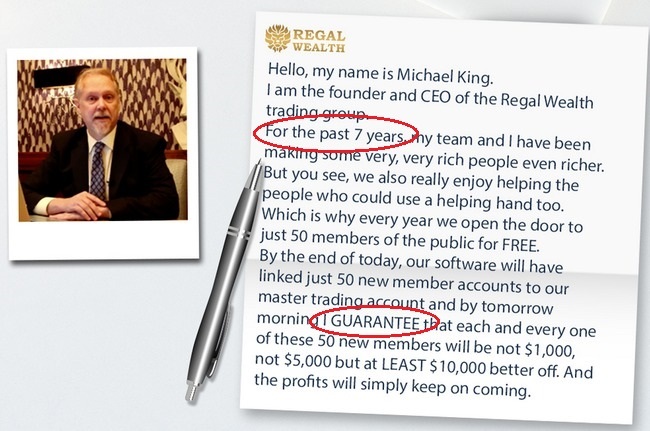 If you scroll down from the sales video, you would have came across this welcome statement from Michael King, the alleged founder and CEO of Regal Wealth trading group. In the statement, it’s stated clearly that he has been helping rich people get richer with his Regal Wealth software for the past 7 years. To benefit the general public, each year he opens 50 spots to new members. He claims that you have the chance to grab a spot for yourself, which is the entire point of the sales material. To sign you up with the software. To determine if Regal Wealth software has really been around for 7 years, we consulted the whois information for regal-wealth.co, which contains some crucial information such as the creation date of the website. Please keep in mind that Regal Wealth software can only be obtained through the website itself. It’s tied to the broker account you sign up through their sign-up form in the website. There’s no other ways to obtain the software even if you wanted. 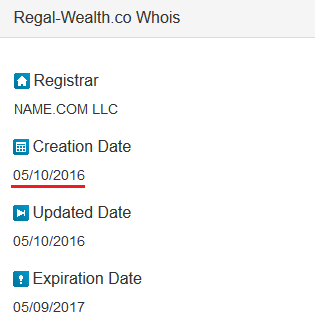 Turns out that the website of Regal Wealth was only created on 10th May 2016, barely one month old at the time of this review. How is it possible for the software to have existed for the past 7 years? The truth is, Regal Wealth is a binary trading software scam that has just surfaced recently, and the statement is full of lies to confuse its victims. Not only that, Regal Wealth trading group is just a fabricated name used to promote the scam. The trading group doesn’t exist, and Regal Wealth software is just a white-labeled generic binary trading software used by many other scams we’ve reviewed before. As much as Regal Wealth scam wants to keep you in the dark, they have to reveal the true nature of their software somewhere in the website, or risk being on the receiving end of legal actions. The chose to hide the truth deep in the risk disclaimer, in which you can’t find anywhere in the sales material. The only way to access the document is to scroll to the bottom of the page and look for a small fine-print that that reads ‘risk disclaimer’. You can authenticate the terms we’ve quoted here against the original document on their website: websiteterms.co/RegalWealth. Due to the high risk nature of trading, ‘Regal Wealth” explicitly does not make any express or implied warranties or guarantees that user will make any profit or that user will not lose any or all deposited investment funds. Self explanatory – Contrary to what they promise in the sales materials, Regal Wealth scam does not guarantee you any profit. Not only that, you will most likely end up losing ALL your deposited investment funds. Again, Regal Wealth scam admits that trading binary options is extremely risky, and it is only for investors who can stomach the loss of their entire investments. Compare the terms stated in their risk disclaimer against what they promise you in the sales material. Remember the welcome statement by Michael King? He guaranteed that each of the 50 new members will be at least $10,000 better off, but apparently the risk disclaimer of Regal Wealth says otherwise. If Regal Wealth really wants to be truthful, they would’ve told you about the risk of using this software in their sales material. But then again, you wouldn’t have signed up for the blatant scam if they did. Is Regal Wealth a Scam? YES, REGAL WEALTH IS A SCAM. We strongly advise you to stay away from the scam if you don’t want to lose your hard-earned money. Disrupt Trading Review – Scam Exposed!